Wouldn’t it be nice if every day we had at home with our kids we created or did something fun to create memories and build up our bond? My little guy is just about to turn one, and I should be happy about it, but I am actually so sad! How could this year have gone by so quickly!? He is so big! What helps is knowing that I have enjoyed him as a baby. He will still be a baby for most of the next year (to me), but boy does it show me how I need to enjoy these kiddos while I have them at home with me! This year, one of the many things I resolved to do was to have more joy in motherhood. Sometimes I get so caught up in trying to keep the house clean (it’s pretty much always a mess), doing the laundry and the chores, finding me time, making meals, you know, all those stay-at-home motherly things, that I forget (how terrible is this!!!) to enjoy my babies! So, I have had to seek out the fun. Make an effort, to once, twice, sometimes three times a week, do something really fun for all three of us, that builds our connection and bond and creates memories. Here is a list of some of the things we have done so far and have loved. There’s also more ideas on my Pinterest page, just look for the board “baby crafts”. 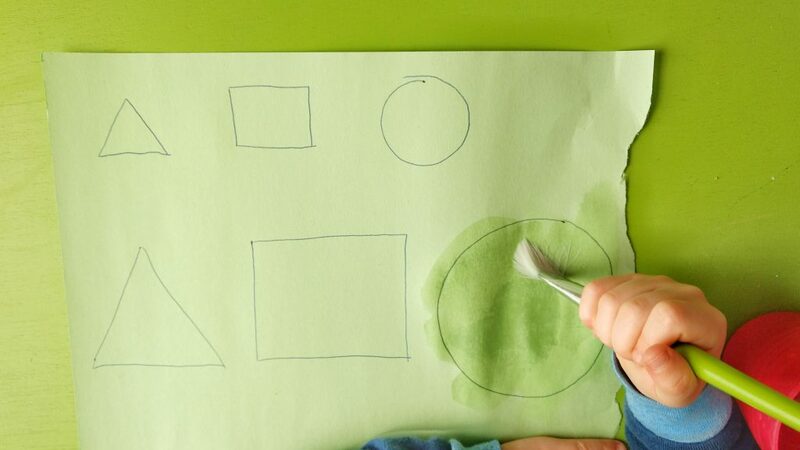 Crafts are super fun for kids, but they are also beneficial for their development! 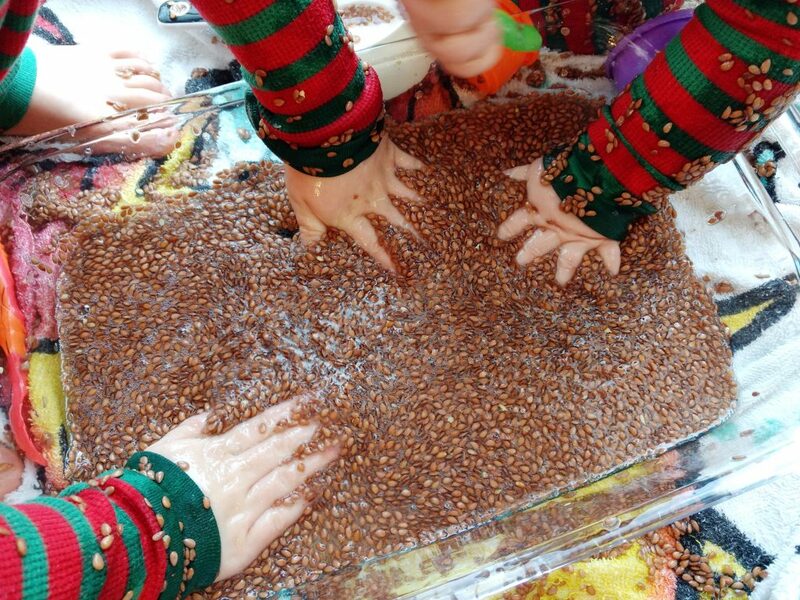 It helps teach fine motor skills, improve their coordination, grow self-esteem and more. 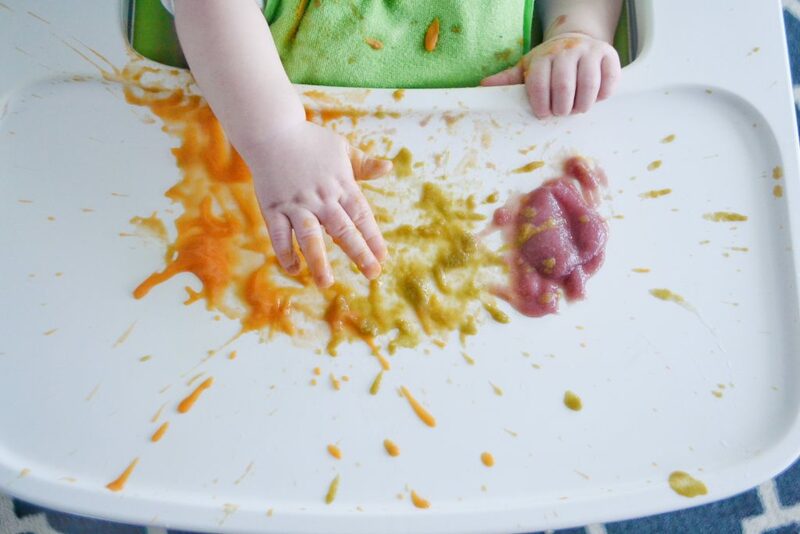 For babies, you can use bright colored baby food purees for the paint, that way it’s completely taste-safe and chemical-free! Mix up the colors by using vibrant colored fruits and veggies. Sweet potatoes and carrots for orange; green beans, peas or spinach for green; blueberries for blue; and beets for pink. 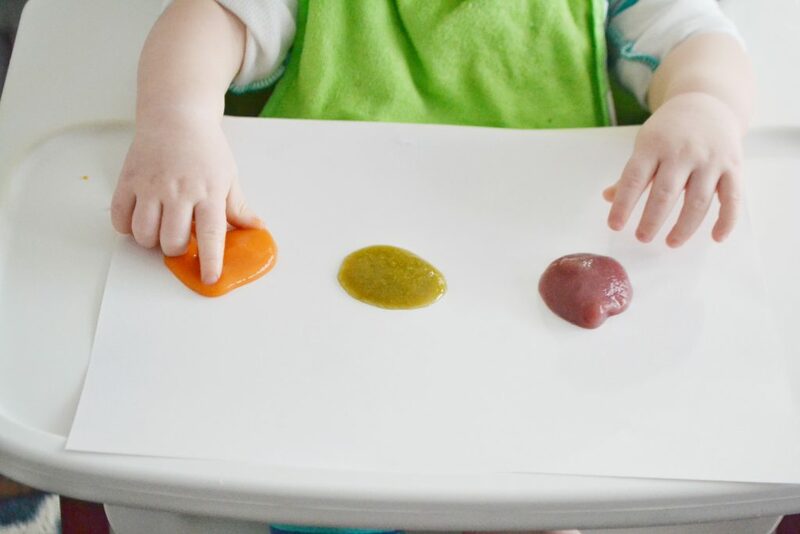 For toddlers, you can make your own non-toxic finger paints with just corn flour, water and food coloring – if you don’t already have baby food purees at home. My toddler LOVES water painting! I love that the clean up is easier than paints lol 😉 It’s so easy, all you need is a cup of water, paper and a paint brush! Sometimes we do free painting, where he just paints what he wants, and other times we make it more educational, and I’ll draw shapes and he gets to paint in the lines. 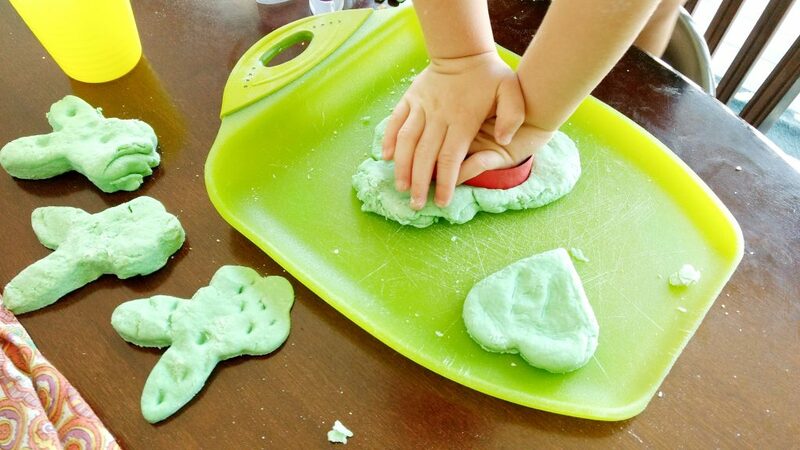 For toddlers that love cooking and crafts, this salt dough cut outs activity combines the two! We usually have this as an ongoing project. One day we’ll make the dough, do the cut outs and bake it. The next day or week we’ll paint them. These make great (and cheap) gifts for relatives. 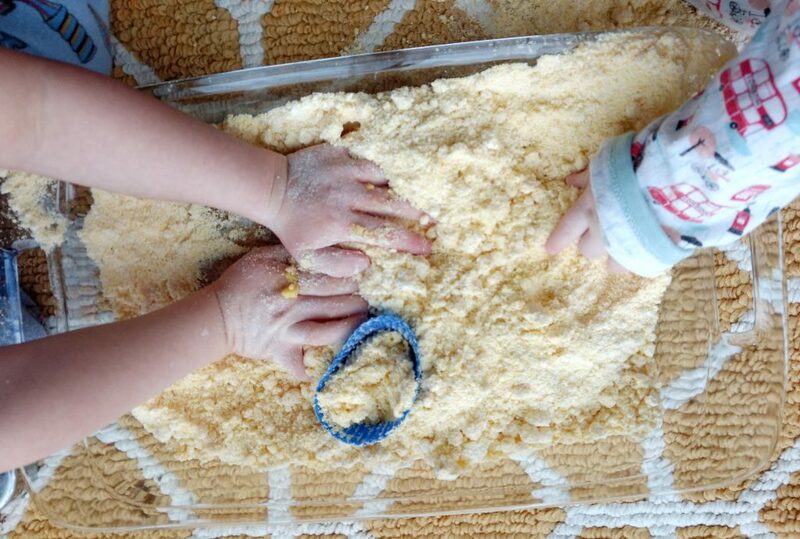 We have been doing a lot of sensory play lately, mostly because now that I have a toddler and a baby, I want to do things that we can ALL enjoy together, without having to constantly watch baby to be sure he doesn’t get hurt or eat something. 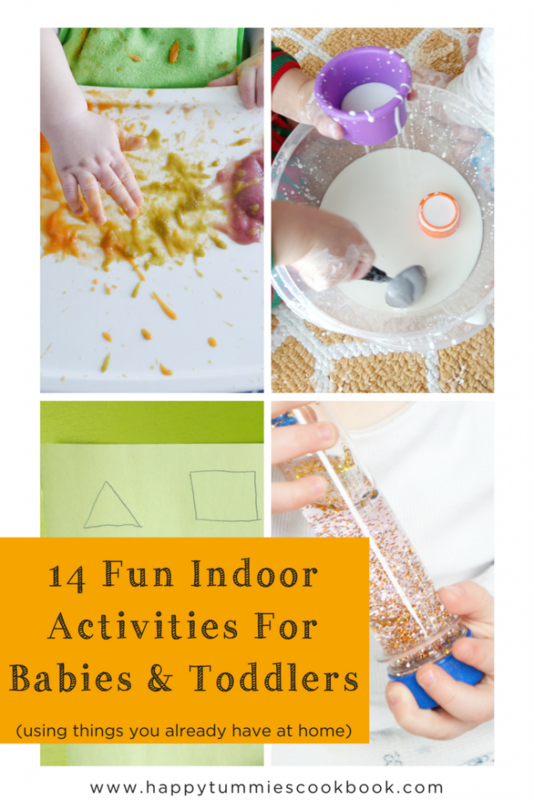 Almost all of these are baby-safe activities, but are fun for toddlers too! 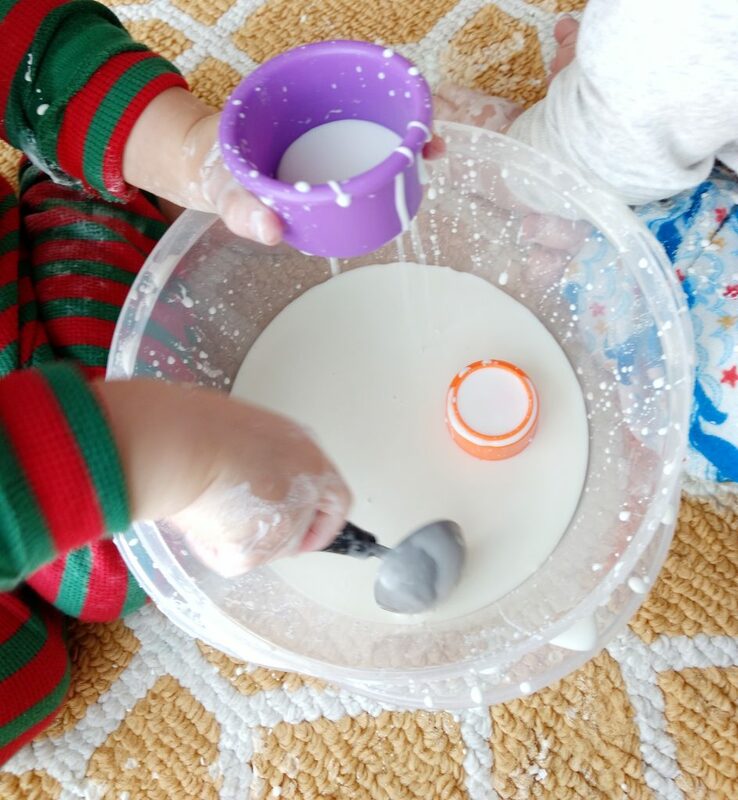 We like to make it more exciting by adding in measuring spoons and cups to play fill and dump, and plastic animals for pretend play. 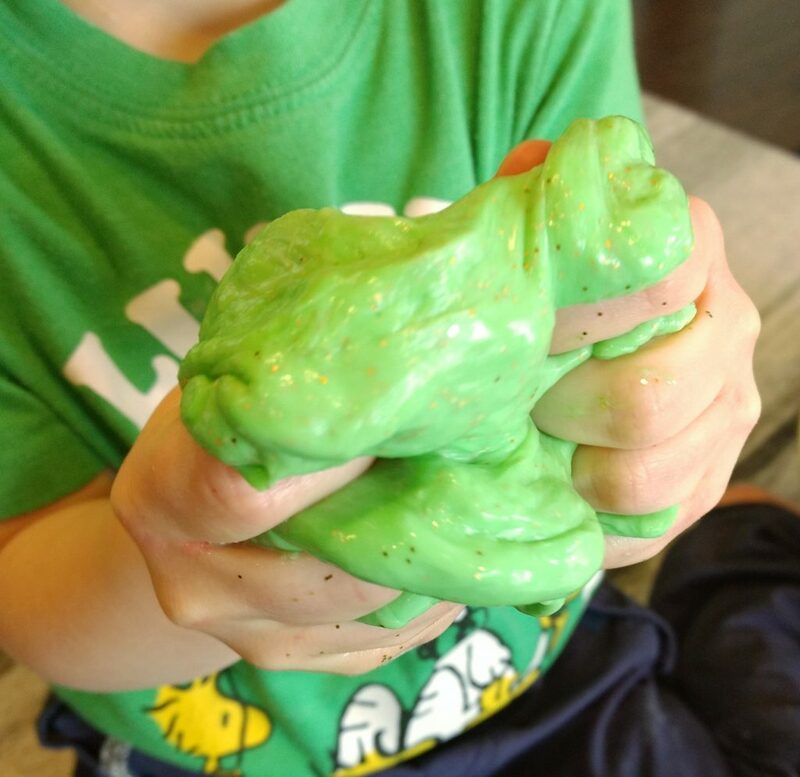 Super fun goo for babies and toddlers. All you need is flax seed and water! 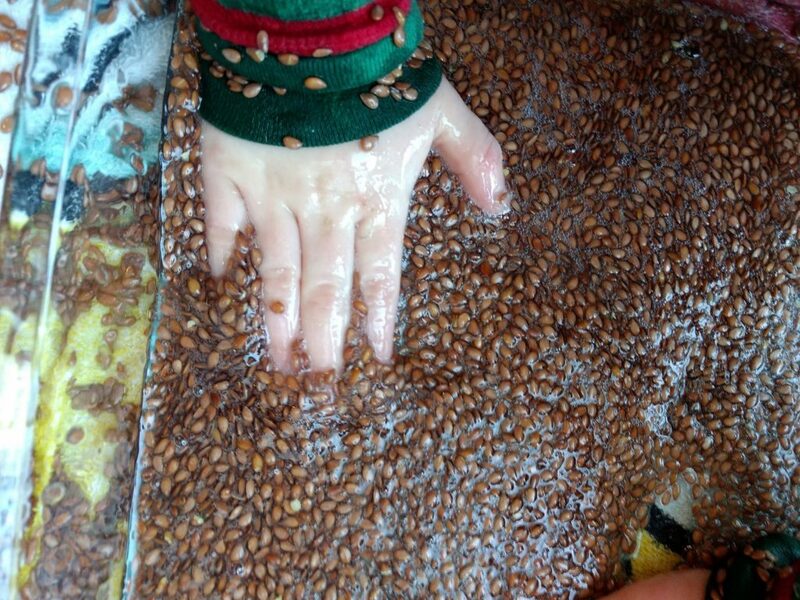 This is one of my favorite sensory activities that we have done, only because it feels so cool! I recommend putting a towel underneath your bowl, as this one gets messy! 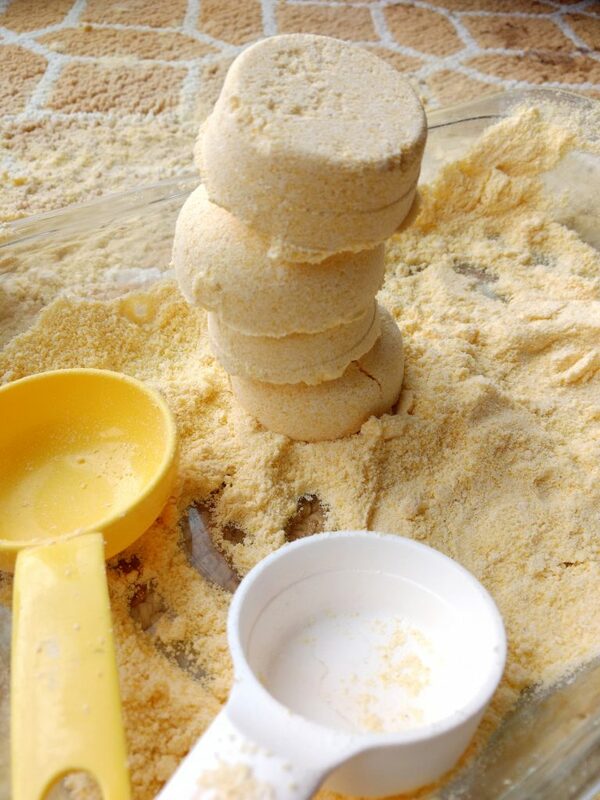 This is a coarse, grainy sand, similar to beach sand, that you make with just a few simple kitchen ingredients. A friend of mine gave me the idea to teach the boys about colors with homemade play dough. 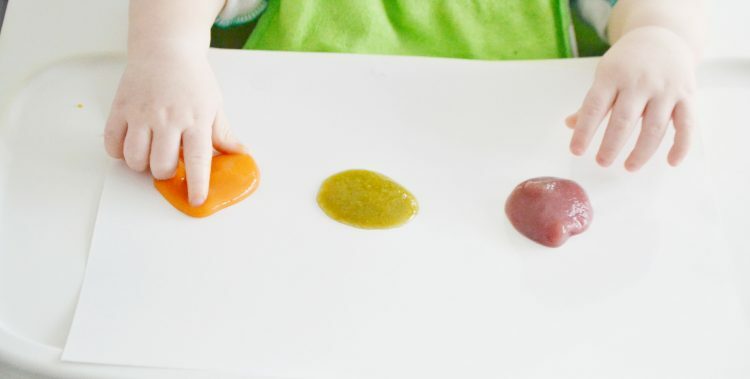 If you make primary color play dough (red, blue, and yellow), you can allow them to mix the colors and make secondary colors and tertiary colors (purple, green and orange)! 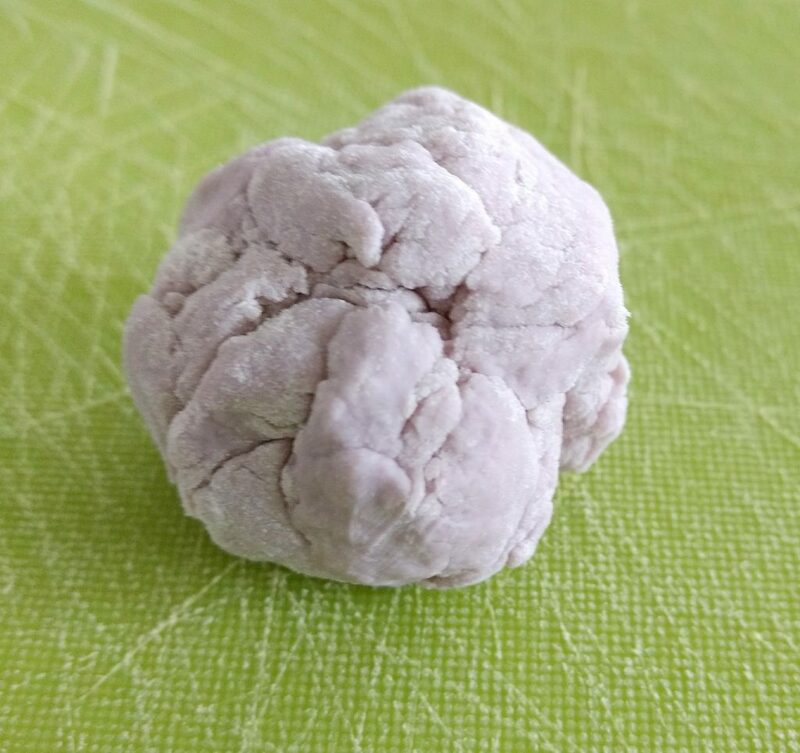 This activity is a twist on the traditional homemade play dough, as it uses Kool-Aid mix to make it smell absolutely amazing! 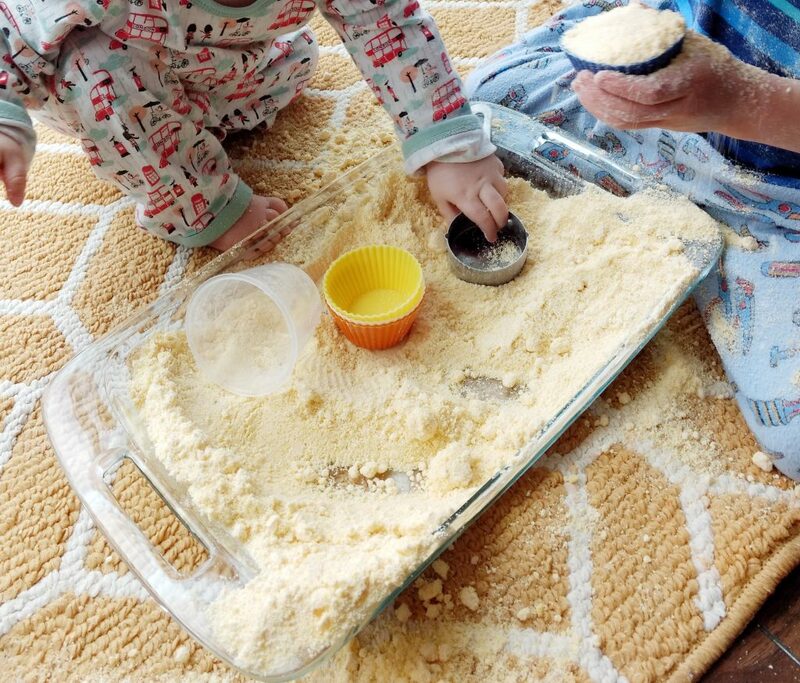 This is a classic sensory activity! The kids love how it is hard when you poke it, then it just melts in your hands! I give my kids spoons and cups to play with to add to the fun. 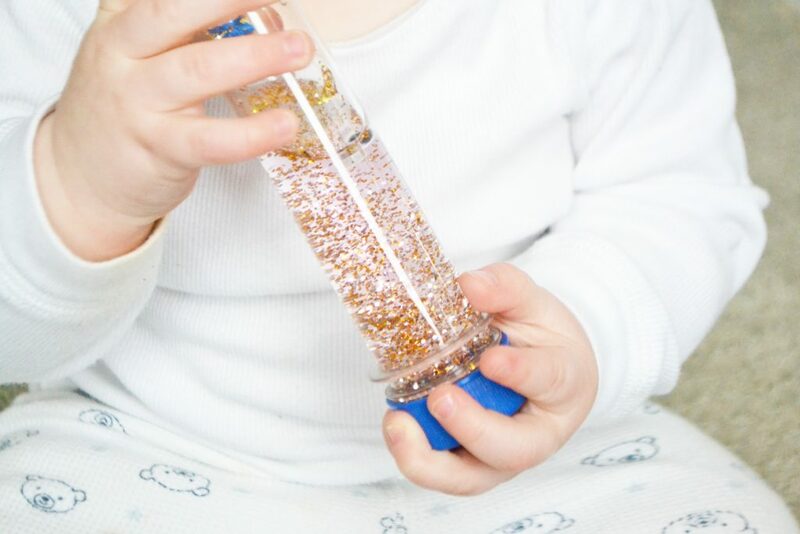 Babies love to play with these, and toddlers love to make them! Just take any tube with a lid that you have at home (a water bottle also works!). Add in sequins, beads, tiny plastic toys, food coloring, poms and/or glitter and fill with water. 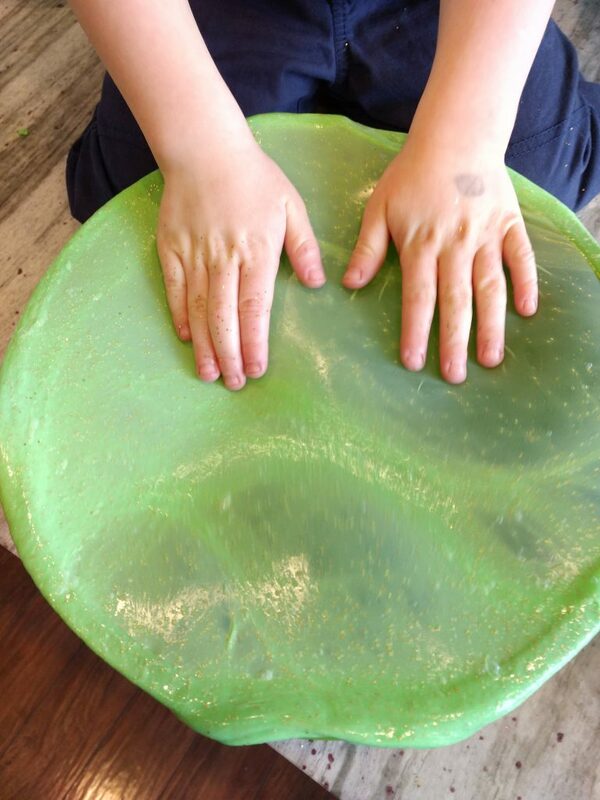 Glue the lid shut and let your kiddos have fun turning it upside down and watching the things inside float up and down. I just recently discovered this. Foam cut outs (like from the craft store) stick to windows when you dip it in water! This has given the three of us HOURS of fun. They stick to windows for 2-3 days, and come off with no mess! Around Valentine’s day I got a some heart foam cut outs, for about $4, put water in a bowl, and we all sat on the ground by by sliding glass door and would decorate the window with hearts. 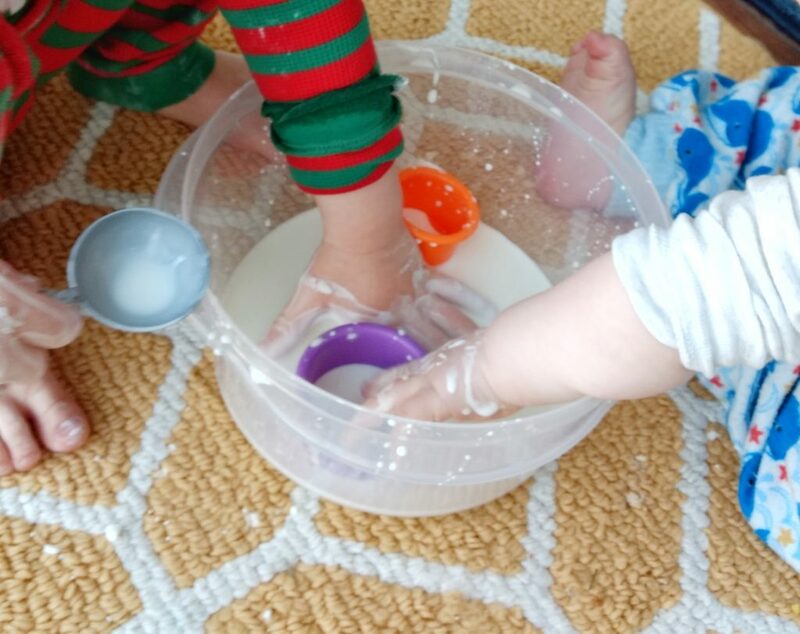 The baby enjoyed the water play and putting the foams in and out of the water. Bonus, my house got decorated for the holiday!! 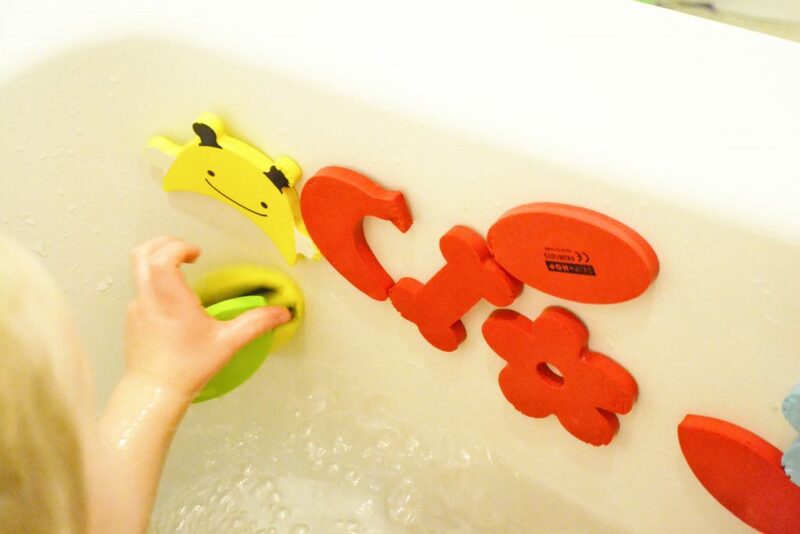 This also works in the tub! 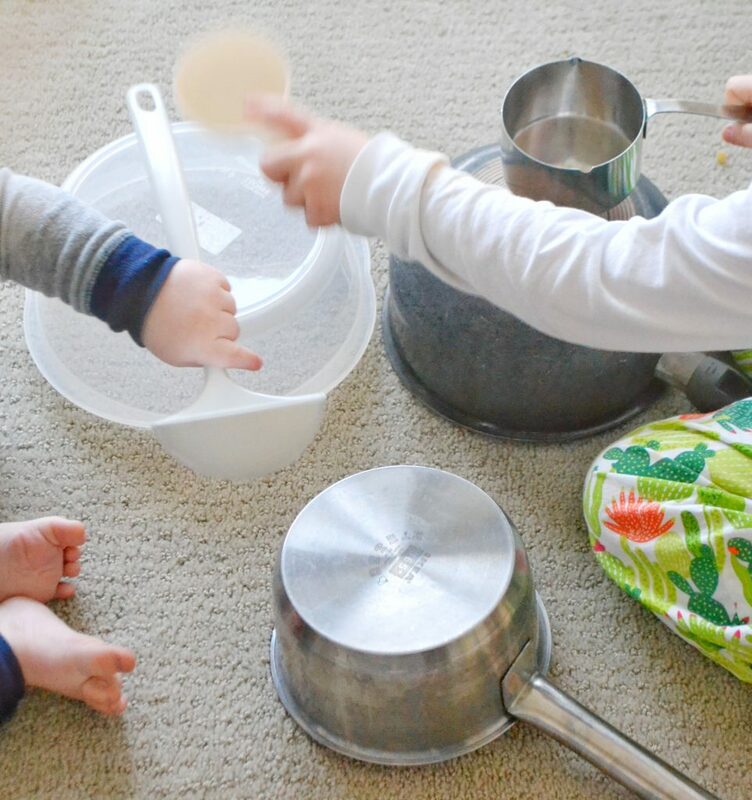 Banging on pots and pans is so simple, but so fun! This activity also keeps the kiddos busy while I’m unloading the dishwasher or cooking dinner. In our house, we love snactivities! It’s an activity plus a snack all in one!! For this one, we like to toast some bread, and get out the peanut butter and then raid our pantry and fridge for fun toppings. 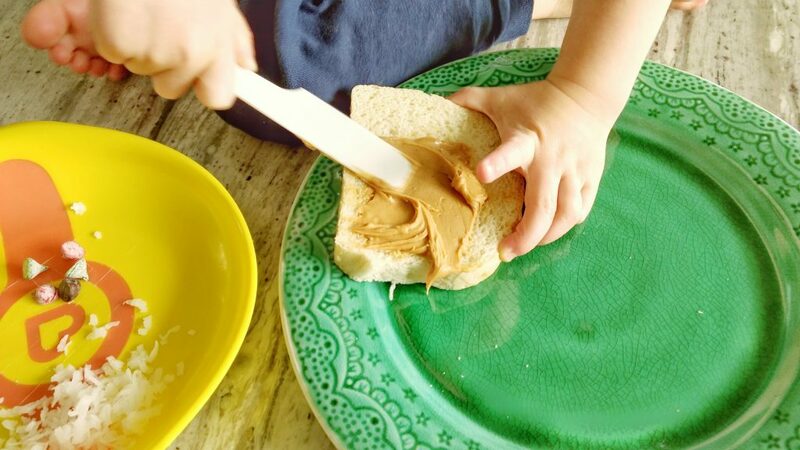 I let my toddler smear his own peanut butter (messy, but he liked it! ), and then decorate his toast to make a funny face. I made one too :0) We’ve used shredded coconut, hemp seeds, mini chocolate chips, raisins, blueberries, and banana slices, but it’s really whatever you like and already have at home that makes it easy and fun! 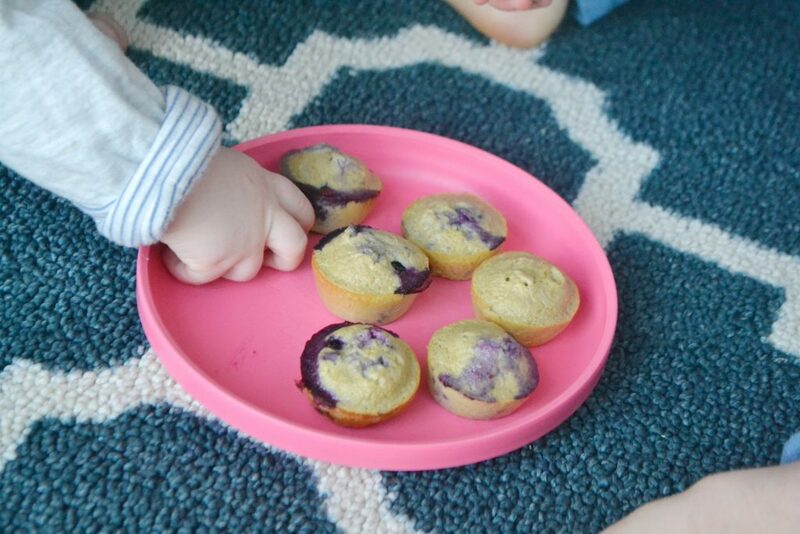 Healthy muffins and pancakes for baby led weaning have been my jam lately (you already know if you’ve seen my Instagram lol). I am all about two or three ingredient muffins (especially when you can make them in a blender), and I love to experiment adding in different veggies (like spinach). The cooking may not be so fun for a baby (he’ll enjoy the snack part later on! 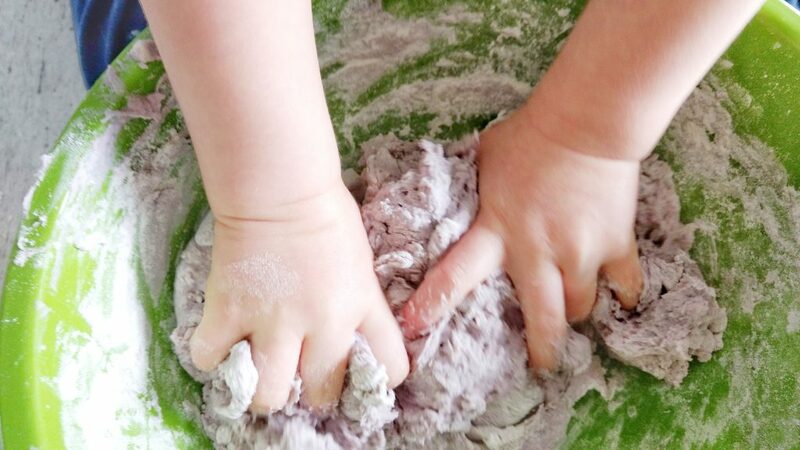 ), but you can invite your toddler to help you make them, like peeling the bananas, cracking the egg, mixing the ingredients, or pouring the batter into muffin tins. 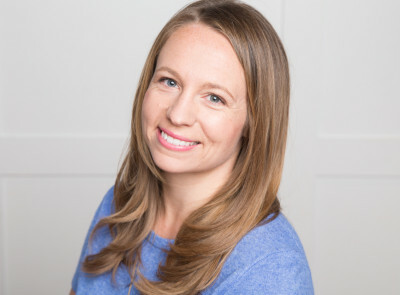 I post a bunch of healthy baby led weaning and toddler recipes on my Pinterest too (@happytummiescookbook), if you don’t already have my cookbook or are looking for more ideas! 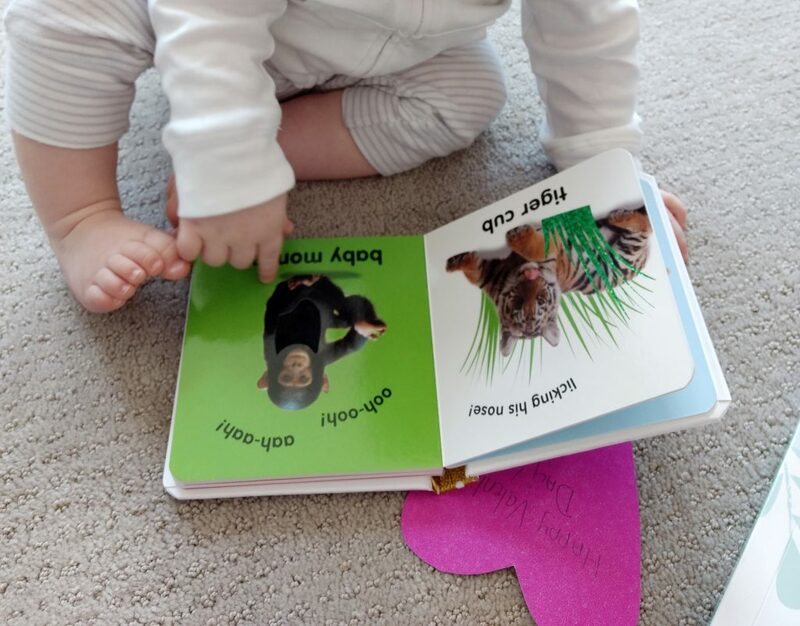 Cuddle up, and bring out some of babys’ favorite books. Hello! 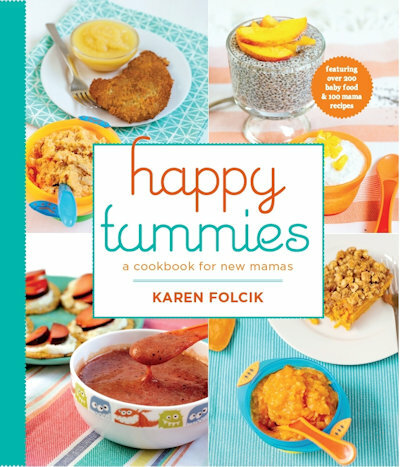 I am Karen Folcik, a wife, mama, speaker and author of Happy Tummies: A Cookbook for New Mamas. For recipes, tips and more follow me @happytummiescookbook on Instagram, Facebook and Pinterest.